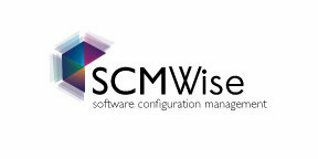 SCMWise stands for Software Configuration Management and is essentially a discipline within software engineering. It is the processes and techniques used by organisations to manage the changes introduced to its software. The main aims of software configuration management are to identify individual elements within the software, track any changes to these elements, manage version selection, control and create a baseline for reflection of the success of the platform. It is also sometimes known as software control management and sis central to managing large and complex software systems. If you apply SCM systems to your work, then you are essentially attempting to eliminate confusions caused by miscommunication amongst team members. The SCM system ensures that there is no redundant work completed, that updates are effectively rolled out, that there are no configuration problems. That the team is coordination in the management of software, that defects are tracked and that there is the appropriate information available to the team including design documents, test output and user manuals. The point of SCM is to ensure the integrity and reliability of software products, making sure that any production can be replicated from conception to release. SCMWise is a website that has grown organically based on its users’ needs. All you need to know about the site is in the About Me section. It is the idea that a website is a great place to store information and documentation all in one place and effectively organise this under menus and headings. The initial motivation for the site was to store technical catalogues, scripts and how-tos – so essentially an advanced file storage system. However, the site has evolved to be something more akin to a gather of SCM minded professionals would want to know about software engineering and project management. The pages that proved most popular to visitors became the ones that emerged as the main focus on the site. Therefore, there are lots of information on SCM jobs, the salaries and the way to succeed in an interview. Yet, there is much more here than that. There are pages upon pages of detailed information about project management specifically and software engineering project management specifically. This information ranges from the most basic definitions of what is SCM and what is project management to more complex discussions about builds and version controls. Part of the philosophy of SCMWise is to explore what it took to get the website noticed and used by professionals. The site offers a personal exploration of how it became successful, to help others do the same. From its conception on free hosting sites, which it describes as a “clunky” effort, it began to use a tool called Site Build It, or SBI. SBI includes all the tools needed for proven, long-term, profitable e-business – or so SCMWise claims. The aim of Site Build It is to get great content, drive content to the site, presell and then monetize.It offers a block by block builder, which means you do not need to understand coding. The tool helps build pages that are search engine effective. The rest of the site includes a blog dedicated to best practices, SCM experts offering comment and Frequently Asked Questions. Essentially, this is what it claims: a repository for all the information you might need… oh and some affiliate marketing along the way. What Can You Find If You Visit The Site? The website has clearly evolved as the needs of the users have become clear. There are pages of information related to business and management. These pages include information on change management, project management and web management. However, there is also information on technical details including builds, version control and IT in general. The main focus of the site has developed into a focus on jobs and salaries – with a place to search for SCM jobs and a place to compare salaries. The site has the potential to be intimidating for the uninitiated. The design is functional and it looks like a site a person who writes technical manuals might write. There are buttons and menus all over the place and no images or icons to help support navigation. However, there has been a lot of effort into the organisation and there is a comprehensive sitemap that helps the user navigate to the information they might be interested in reading about. It is absolutely crammed with useful information for the SCM professional and for this reason the site has clearly become successful. In terms of considering alternatives, it depends on what you want to achieve. Do you want to collaborate with other SCM professionals and find out all the information you could ever want about document and code management in software development? Or, do you want a system of organising information in a central repository in a way that improves the reliability and integrity of software development? In short, there are very few places where you can hope to find the same level of information about SCM than at SCMWise. It might not be kept as up-to-date as you would hope, but there is still a wealth of impressive information that can help you develop an understanding of all issues related to software control. However, if you want to build a similar area for documents and information about code that can be used by you are your colleagues, then there is a lot of choice in Project Document Control software and Quality Management software. 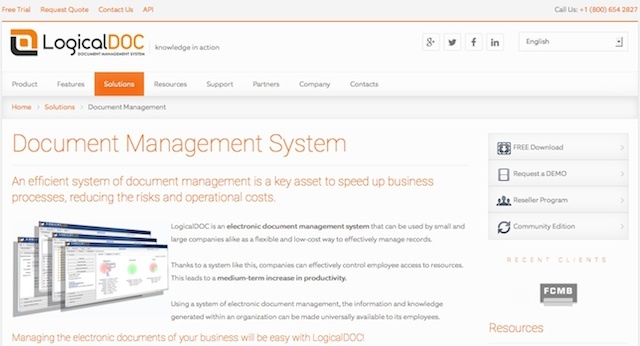 This is a document management platform, that allows you to organise all sorts of documentation in a way that is accessible through searches for keywords or for content searches. This is a data entry and document retrieval tool and nothing more – and in this simplicity, it is of great use to SCM professionals. The site is accessible via a desktop web page in its free version – and via phone and tablet if you upgrade to the business version. The platform is multilingual and offers full-text indexing and many languages. You can tag documents and insert metadata and bookmarks, that makes finding the information you need easy. If you subscribe to the business version you can drag and drop files from your desktop and it will convert files types for you. There is even an internal messaging system where SCM professionals could exchange ideas and latest industry information. If you are looking for version control software, then AVN: Subversion is the most popular Configuration Management tool and it is open source, meaning it is freely available on the internet. Its key features include: easy setup, gives visibility to changes, automatic merging and conflict resolution between versions, full revision history is maintained without having to rename files, integration with almost all platforms you would be using and it is easy to switch to – even mid-project. 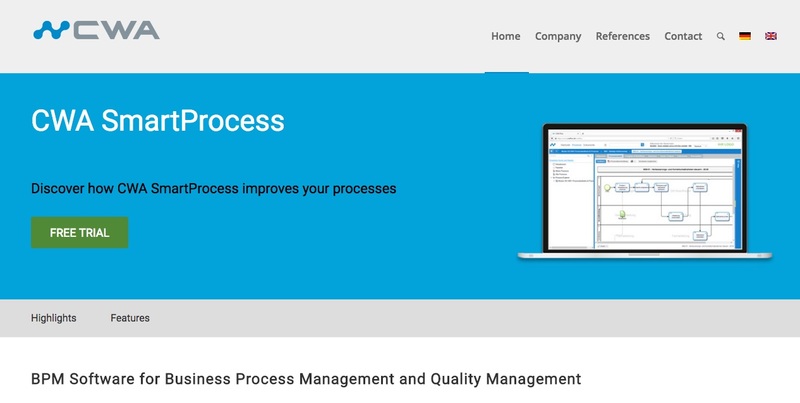 This is a business process management software that includes tools that manage quality control and workflow. It offers simple modelling, optimisation and publication of processes and documents in a central place. The software not only allows you to store documents and processes in an easy format but you can also automate some of these processes within the software. The software is web-based, meaning it is accessible wherever you need it. There is an organisation chart available, so you can store your data. But not only this can automate certain workflows and offers a quality module for audits, measures, tests, etc. At its simplest; this software is a publishing tool that helps you to create process amps and publish these to employees. It enables you to demonstrate structures and dependencies that all professionals would need to know. You can produce these models directly into the browser and use BPMN notation to act as known symbols that all SCM professionals should recognise. Not only does it organise documents, it also allows you to preview these documents online. This is better than your standard web page, where documents would need to be downloaded to be viewed. Software Configuration Management is a complex profession, highly pressured and covering both IT and business management. This makes a central repository of best practice, like in SCMWise absolutely essential, if you are to get up to date with all that you need to consider, from comments on the build to version control, to project management to ideas of how to get a job and move jobs. The way the site has evolved into an excellent demonstration of SCM practices – with the clear sitemaps and evolution history – as well as the menus and sub-menus – which help with information storage and retrieval. The advice on the site is to use Site Build It to make your information visible via the internet and make money from the organisation of your information. If you are more interested in platforms that will help with the work of the SCM professional, then there are many applications designed specifically for this. There are process design platforms, document repositories and places where professionals can share expertise. 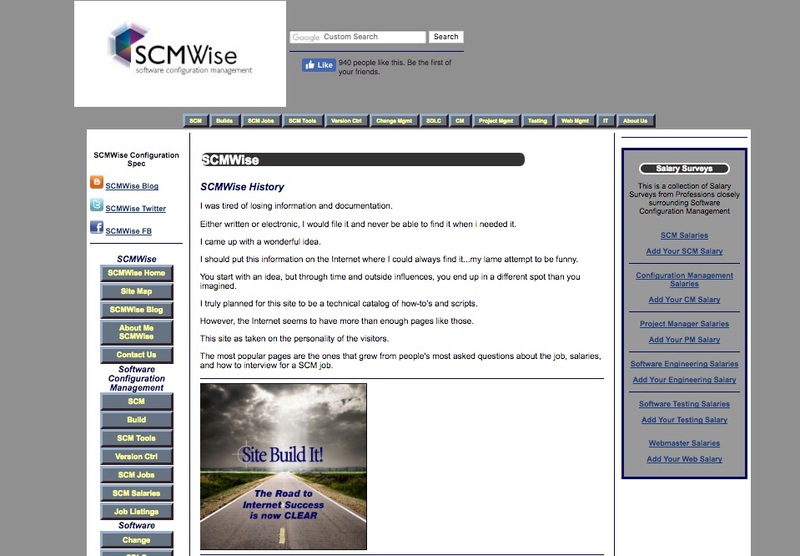 SCMWise shows you what is possible using a simple website build. But maybe there are platforms out there that can now do this in a way that better supports the work of the professional in software engineering. After reading our SMCWise Review, check more project management software reviews.